Now that we’ve shared Our Favorite Kids’ Books of the Year, we are moving on to fun toys and cute clothes for your little ones. We started by adding some Boneau and Curtis favorites, and then sprinkled in a handful of gifts we know they would love. Share the top gifts your kids are asking for with us in the comments below. Take a peek at our holiday wishlists For the Crafter, For the Dudes, For Jaime, and For Jacinda. Have some fun indoors during the winter with a croquet set from Land of Nod. I love the design of the Arbor Skateboards, especially this Timeless Skateboard. These boards are made using sustainable materials and a portion of your purchase goes to the Hawaiian Legacy Forests organization that focuses on restoring the Hawaiian forest ecosystem. 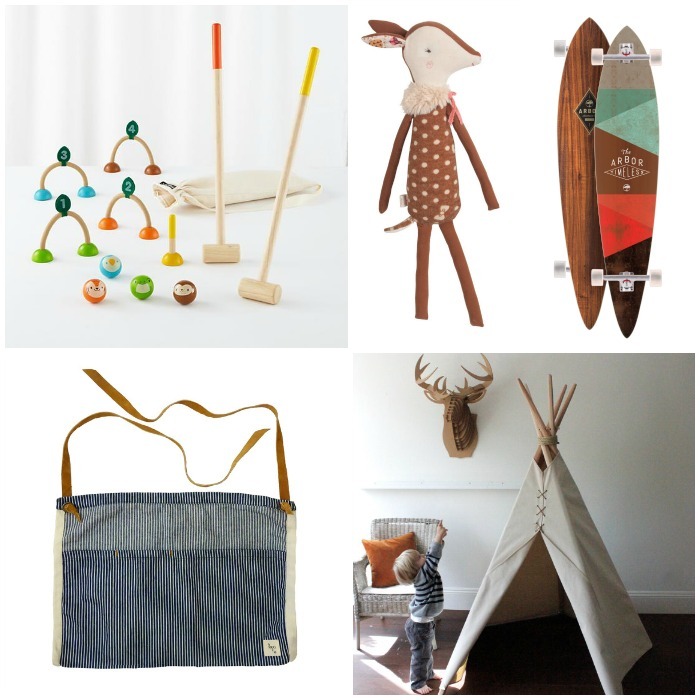 Prop up a hideaway filled with gifts with this teepee made by House In Habit. The Bambi Deer Doll from Smitten for the Wee Generation makes for the cutest cuddle buddy. I fell in love with this Denim and leather apron by Nico Nico and desperately want to get it for every child I know. 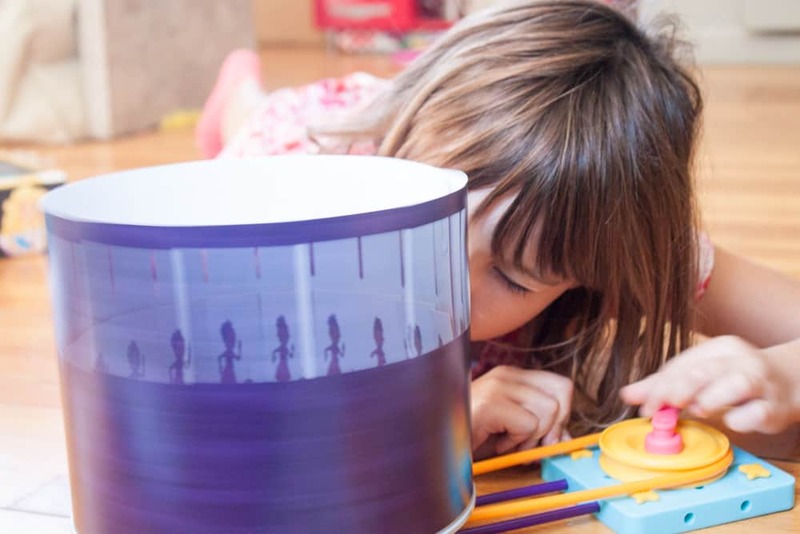 We can’t get enough of the GoldieBlox collections, including theGoldieBlox and The Spinning Machine and the GoldieBlox and The Movie Machine. Scarlet has been testing her directorial skills with movies galore. 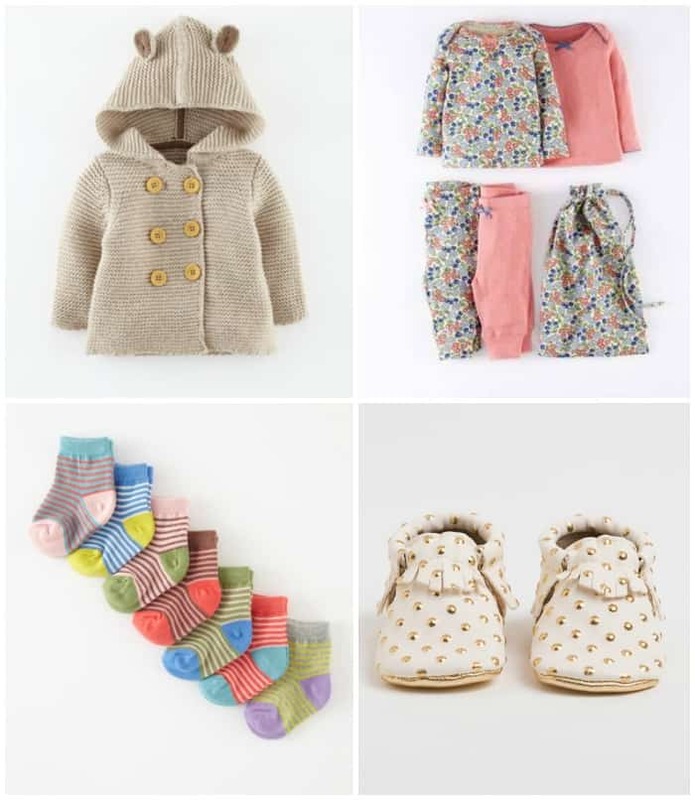 Bundle up Baby with this knitted jacket, cosy pointelle mix-and-match pack of jammies, and a new set of winter socks from Mini Boden. Freshly Picked has released these beautiful Cream and Gold Moccasins! I want them for myself. Fill their stocking with their own hand drawn, personalized paper doll you can print right from your computer from Lily and Thistle. 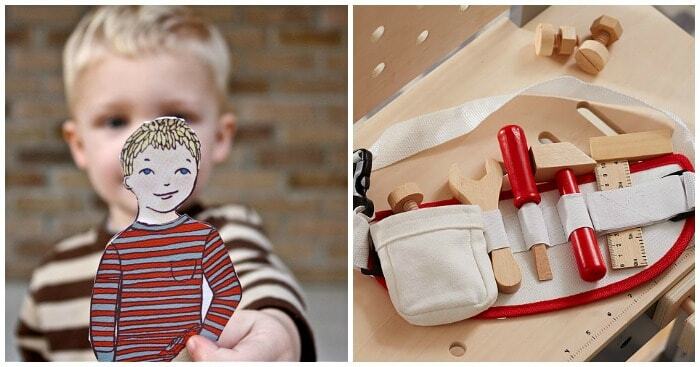 Surprise him/her with a sturdy tool belt from Pottery Barn Kids. Mark their big milestones on The Birthday Poster from Sticky Bellies. Make the poster a Christmas tradition and give them one each year to fill out. 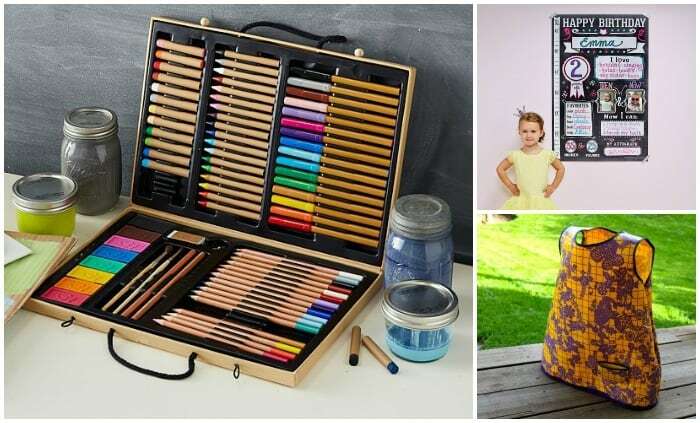 Your mini Monet might just love a new art set from Pottery Barn Kids. Don’t forget to also put your sewing skills to the test and make our DIY Art Smock to go with the gift. 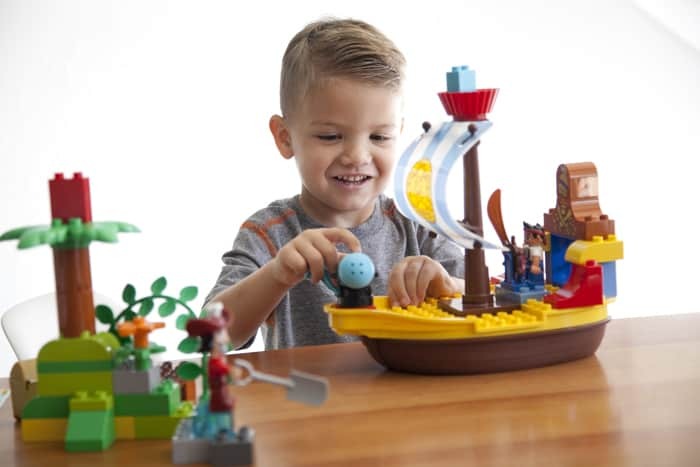 Gordon watches Jake and the Never Land Pirates every Friday on Disney Junior at 8:30am/7:30c and has played with his Lego® Duplo Jake’s Pirate Ship Bucky literally every day since October. I’m guessing Santa will be bringing more of the set for him this Christmas. 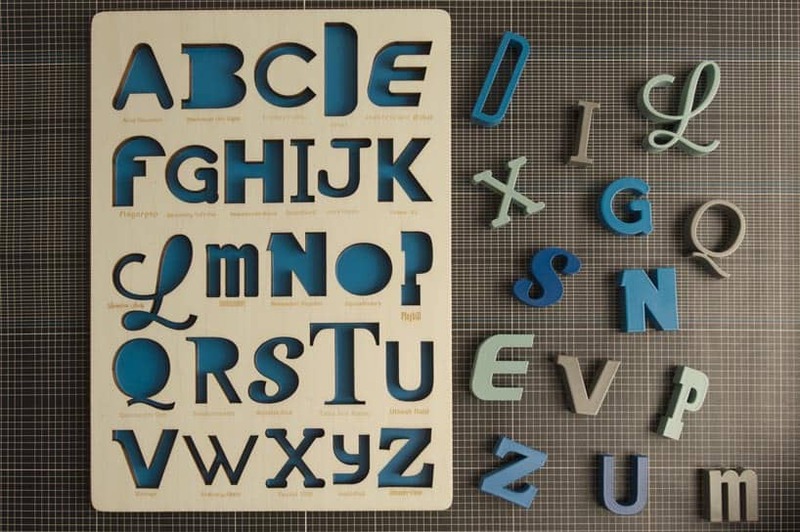 If you have the urge to splurge for some handcrafted gems this year, order this amazing Fonts puzzle from Looodus? How cute are these Italian-made PePe saddle shoes sold at the Little Skye Boutique? For the little ones in the winter cold, send a Winter Set Gift Box from Elks and Angels. 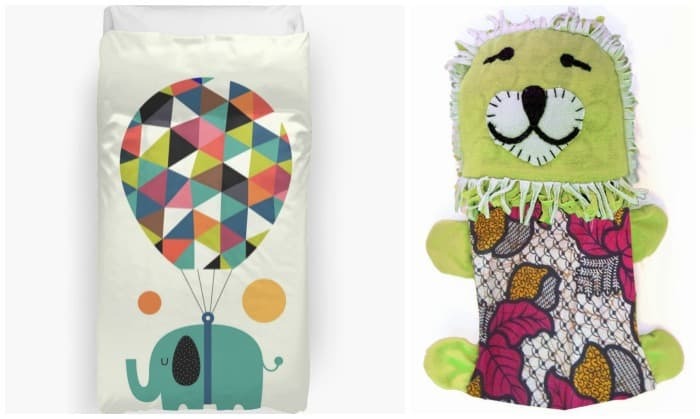 Give their bedroom a small makeover, starting with this Fly High and Dream Big Duvet Cover from RedBubble. They are cozy and come in a huge variety of prints. Give a gift that gives back this year by picking up the adorable Mkango the Lion or one of his many friends from the Dsenyo Collection. These gifts are hand-stitched by a fair trade women’s cooperative in Malawi that helps to empower women by helping them work their way out of poverty. We adore the modern style of this wooden Woodpecker Baby Walker from Amazon. For the little crafter, consider picking up a Make Your Own Mermaid Kit and the Invent Your Own Insect Kit from Seedling. Their mini kits, like the Make Mini Mermaids Kit are the perfect size for stocking stuffers. Word on the street is the Boneau kids might have some goodies in store for them, like maybe this Beginner’s Science Lab and Build-It-Yourself Woodworking Kit from Lakeshore. Kick them out the door (ahem) I mean, send them off to school after the holidays with a new lunch bag, like this Batman Soft Lunch Bag from Genuine Thermos. It might just make their return to school after the long break a little bit easier…maybe. 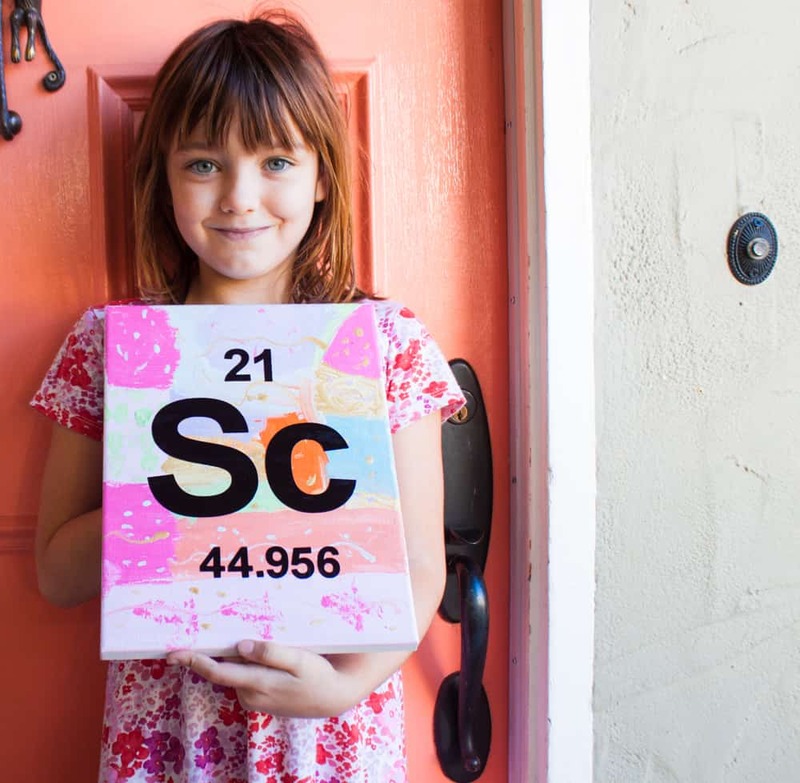 You can top off their science lab with a piece of personalized Period Table of Elements Art you can make yourself.